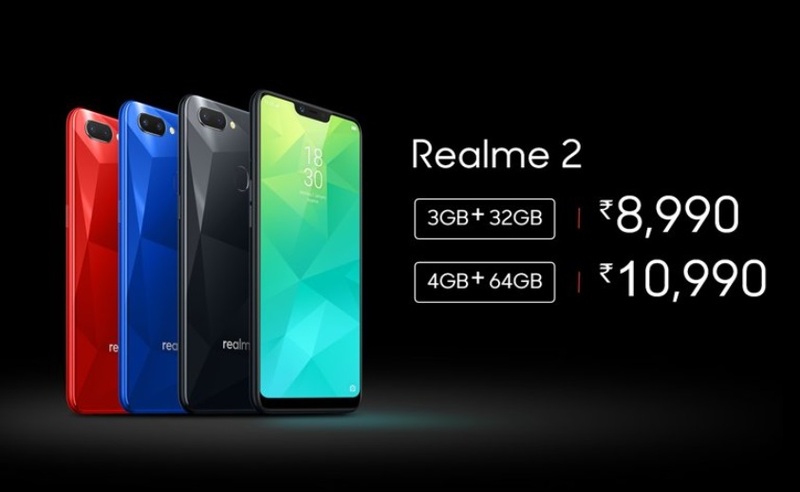 Realme today launched its latest budget smartphone the Realme 2 in India. The Realme 2 is the successor to the Realme 1 which was launched back in May this year. The Realme 2 has been launched in India as a Flipkart exclusive. Some of the key highlights of the device are, dual rear camera setup and a Snapdragon 450 SoC. The real me 2 also comes with a larger 4,230mAh Battery than the 3,410mAh battery of the Realme 1. The Realme 2 comes with a 6.2-inch display with 88.8% screen-to-body ratio and a Notch above. The display also has Corning Gorilla Glass protection. As for the design, the Realme 2 comes with the 2nd generation of Diamond-cutting Design with improved reflecting effect and 12-layer nano-tech. The Realme 2 comes with a triple dedicated slot which can be used to insert memory cards to expand the storage upto 256GB and you can also insert dual 4G sim cards. It is powered by a Snapdragon 450 processor coupled with 3GB and 4GB RAM. To recall, the Realme 1 was launched with a MediaTek Helio P60 processor. It runs on ColorOS 5.1 based Android 8.1 Oreo. The phone also comes with Smart Drive Mode. The smartphone sports dual 13+2 Megapixel rear camera setup at the back. The camera also includes a Bokeh effect. The Realme 2 comes with an 8-Megapixel front camera with AI Shot which also has several beautification features such as Group Selie, AR Stickers, 296 Recognition Spots etc. The Realme 2 comes with three different options to unlock the device. The first one is the Face Unlock just like the Realme 1. There is also a Fingerprint sensor placed at the back of the device and the device also has the third option to unlock the device called the Smart Lock which comes with several customization settings to use. The Realme 2 also packs a larger 4,230mAh battery than the Realme 1’s 3,410mAh battery. The volume rocker keys have been placed on the left side of the device and the power button is on the right.